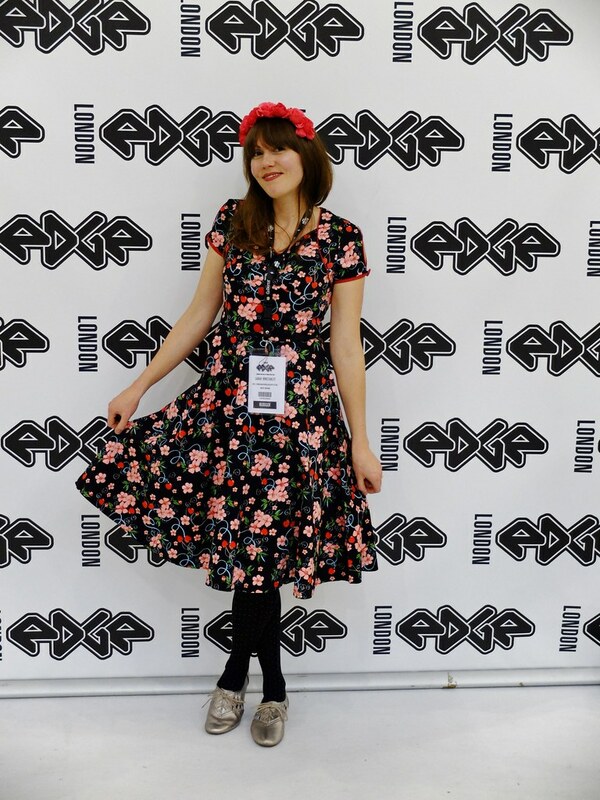 London Edge is a big trade show that runs a couple of times a year and showcases alternative fashion, including vintage styled clothing. You can imagine my delight when the lovely Carly from CiCi & Marie emailed little old me and asked if I would like to accompany her there. 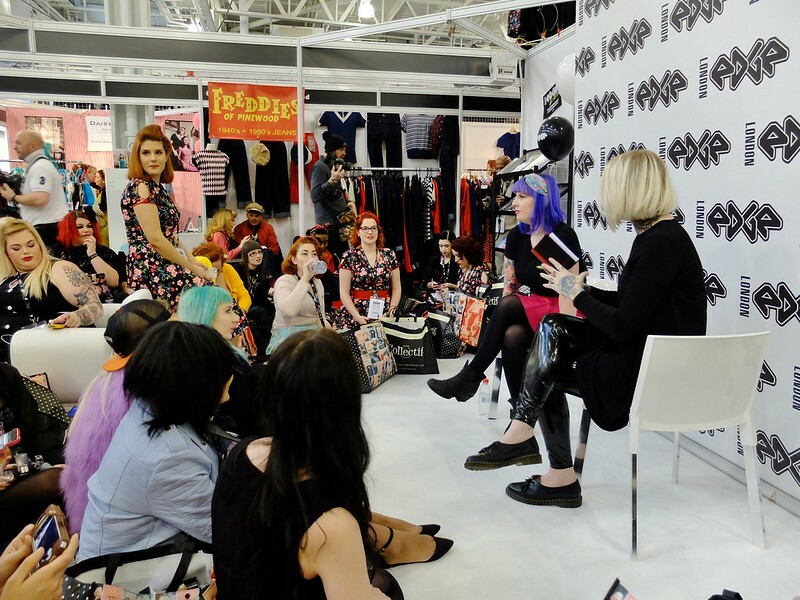 Vintage style clothing brand Voodoo Vixen and its darker side, Jawbreaker, were sponsoring the show, and were recruiting bloggers to attend a press day. In exchange for coverage of the event, bloggers would be gifted a dress to wear on the day, and get to attend the after party. Free dress? Party? Chance to meet Carly? We got in touch with Voodoo Vixen and as soon as our places were confirmed, train tickets were swiftly booked! We were able to choose our dresses in advance, and picked them up on the day. Spookily, we both knew which dress the other would go for - Carly went for the Tilly dress and I went for the Adeline dress. What do you think of our choices? 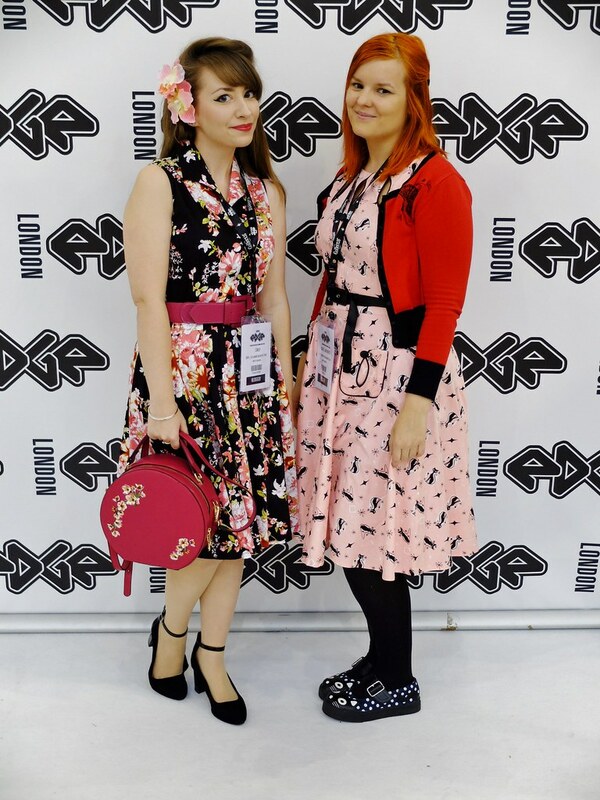 Pictured with Carly above is lovely Yorkshire based blogger Kariss from Shy, Strange, Manic, in the Kitty dress. We bumped into her on our way in to the exhibition centre and she was the third musketeer for the day. I am not sure if I was more excited about all of the vintage dresses, or meeting Carly. I was full of nervous energy and the friend I was staying with in Notting Hill was making jokes about blind dates. I spotted Carly straight away as she got off the train wearing a Hell Bunny coat and her trademark flowers in her hair. It seemed odd seeing each other in real life but I soon relaxed in her company - she is incredibly sweet and has this elegant poise and aura of composure, I felt a bit like a large and over-excited puppy next to her! I also have to report that she is so so pretty, and in the flesh she has a gorgeous smile that lights up her face. Here's what the three of us got up to over the day! In the centre of the tradeshow they set aside a little area as a base for bloggers, with a backdrop for photos, sofas, and sweets and bubbly provided. The friendly staff handed out some very generous goody bags - I can't wait to share some photos of the delights within. I had been looking forward to a talk by Kat Williams, author of uber successful wedding blog, Rock 'N Roll Bride, and she spoke about her blogging journey and how it's led to the recent publication of her print magazine. As part of the Q&A session I asked her what blogs she read for inspiration - to which the answer was none, apart from her friends' blogs. She said that she doesn't want to get influenced by others, which I was surprised at, becuase personally I find so much inspiration from others. The juxtaposition of alternative clothing was quite jarring - it's a weird pairing, the pastel petticoats against a sea of black, black and more black! 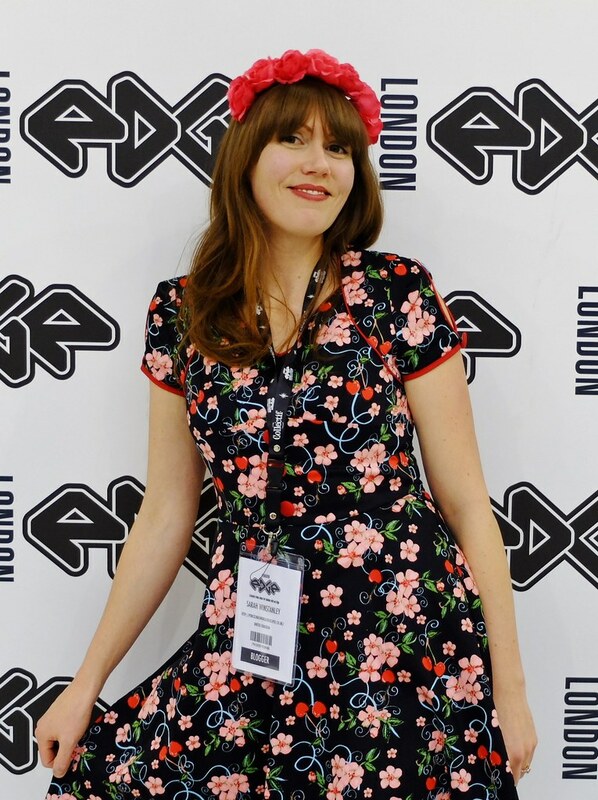 The big brands of vintage style clothing were there, such as Hell Bunny, Voodoo Vixen and Collectif, but it was also great to see some brands that were less well known to me. Some of them were excellent in terms of quality and design, and there was a decent representation of products made in the UK or elsewhere in Europe with high standards. 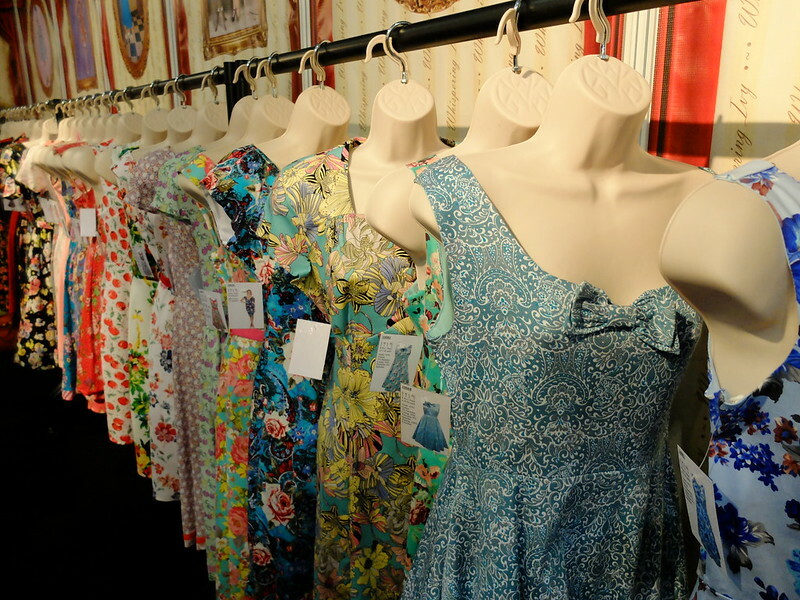 I particularly enjoyed having a chance to see the clothes up close from brands that I normally only have access to online, such as Freddies of Pinewood, Bettie Page shoes, Victory Parade and The Seamstress of Bloomsbury. The wing bust dress from Collectif that we all swooned over! 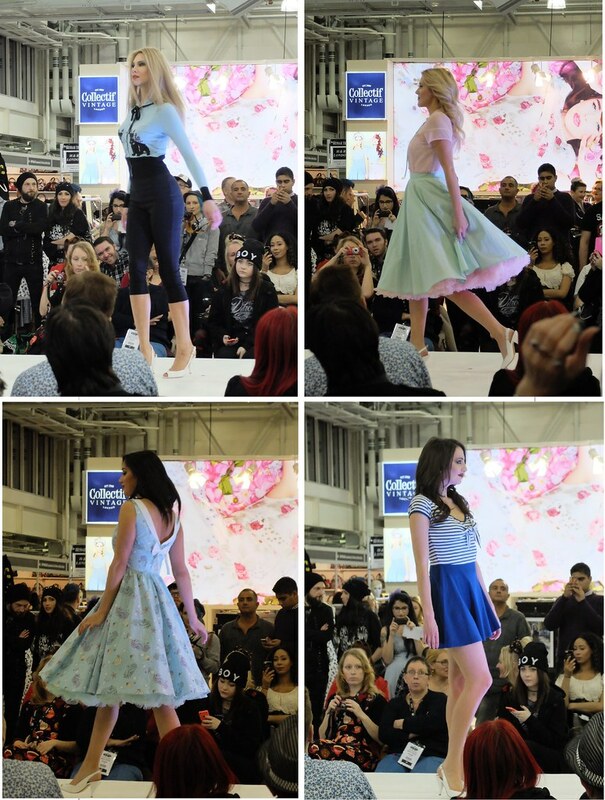 I do love a good fashion show, and there were several throughout the day. Steampunk, gothic, punk and vintage fashions were all represented. I think one of the things I love about vintage styles is the way the clothes move, how they make you stand and walk. There was certainly a lot of swishing! Waiting outside Kensington Olympia were two vintage red double decker buses ready to take us across to Soho where the after party was being held. I swapped my flat brogues (which proved a wise choice after walking around all afternoon) for my heels and we stepped aboard, pleased to get souvenir bus tickets from the conductor! Because I don't go to London very often I quite enjoyed sitting on the bus and looking at London lit up at night. We didn't stay too long at our destination as we all had to get trains and tubes, so we unfortunately missed the entertainment, but I did manage to have a few chats with some fabulously dressed bloggers and take advantage of some free wine. It was a really super day, and the staff did a great job with all of the organisation for the bloggers - thank you to Voodoo Vixen, and of course a huge thank you to CiCi & Marie for inviting me to go with her. It did take me about two days to recover from all of the excitement, and I now have a wish-list of clothing as long as my arm, but I would definitely recommend the show if any of you get a chance to go in the future. 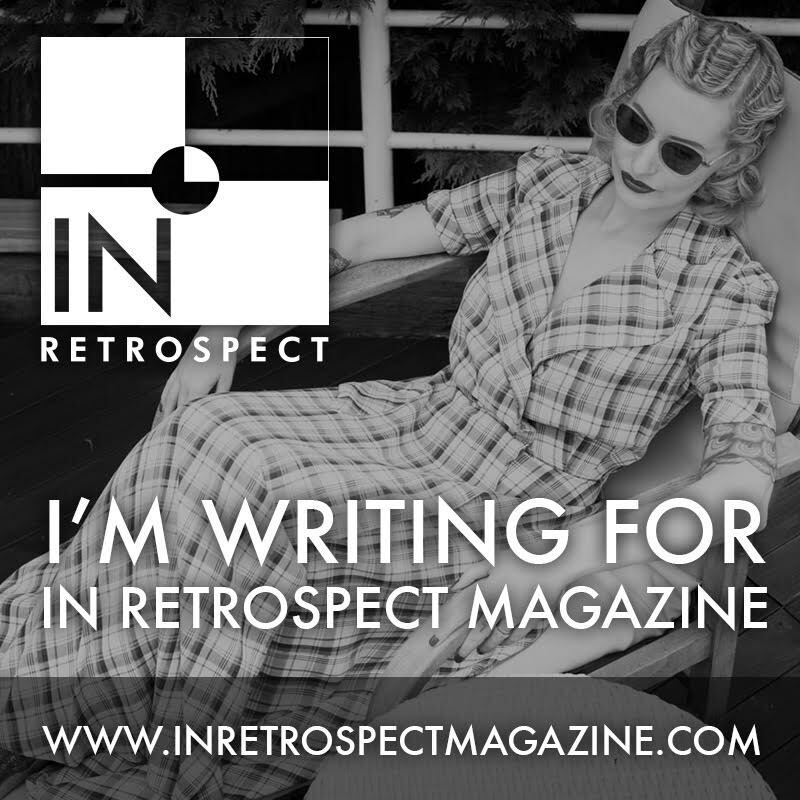 What's your favourite repro brand, have I mentioned it? I'm always keen to hear about new ones! I love the dresses you chose and the pale green and pink outfit on the catwalk looks gorgeous! What a great opportunity! I love you outfits, excellent choices! My sister used to go to London Edge when she owned her own gothic clothing shop, she never did take me with her though dammit! I'm a Hell Bunny girl through and through I know their clothes fit me well, I've had mixed success with other brands. Such a great day, was great to meet you both! I can't wait to get my post written if I recover my photos tomorrow, my laptop has gone bang! This looks like you had a great time! 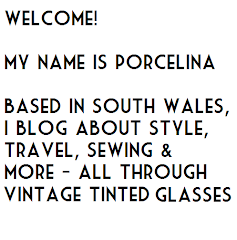 I am not familiar with these brands but there are a few shops in Toronto that cater to this Rockabilly style. One is in my old neighbourhood called Doll Factory by Damzels - I always loved their windows. Those Daisy Dapper dresses look really nice. I'd have taken the opportunity to try on all the shoes, as they're one thing I hate buying online! It sounds as though you had a fantastic time. How funny was that, dear Lady !! I really enjoy your pics and adventures ... I wish that these events do where I live, sigh. 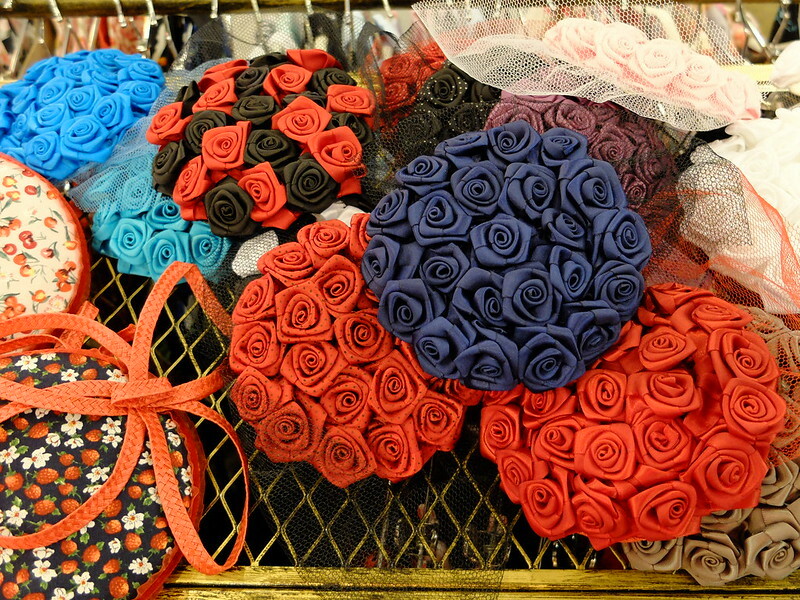 It looks like a day in vintage heaven! The dresses are gorgeous. Thanks for sharing with visible Monday xo. This looks amazing! I love floral dresses, and especially the styles they showed here. 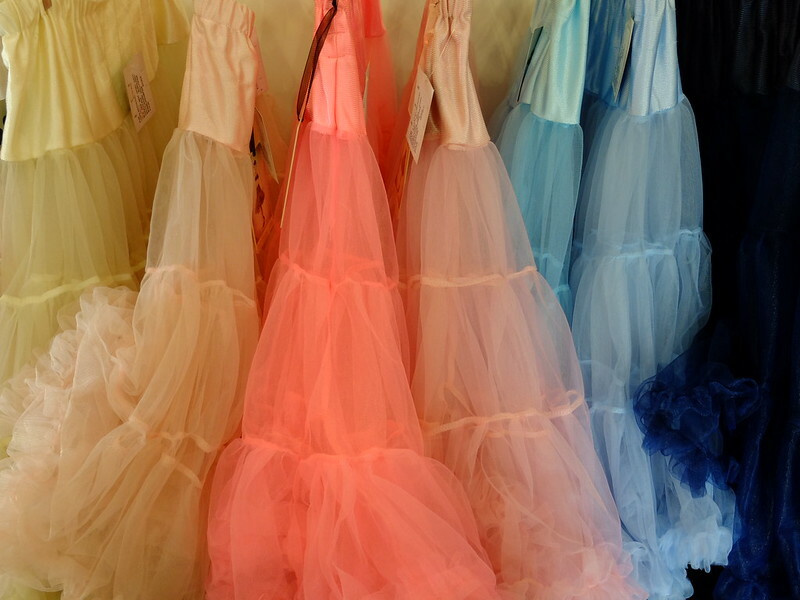 I love your dress, it must have been like a kid in a candy store. Beautiful! 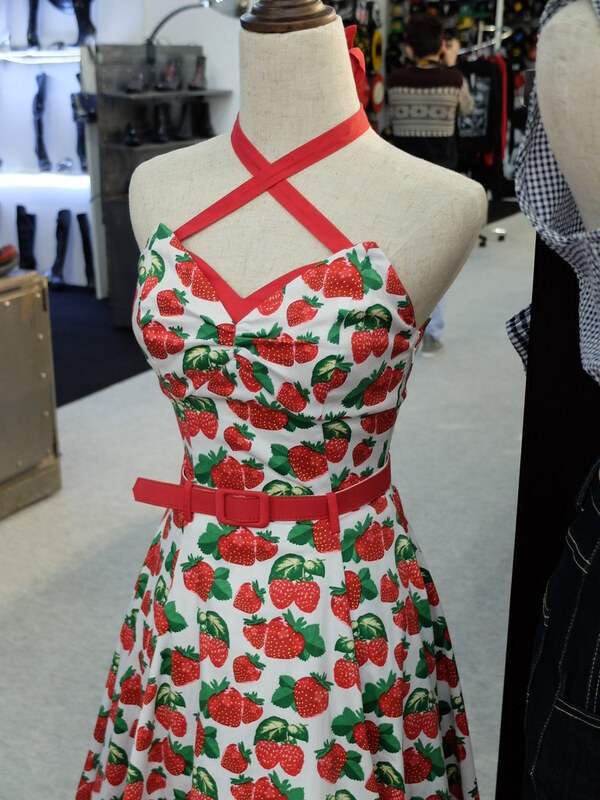 That strawberry dress has me in fits of jealousy. Goodness gracious, there are some seriously fantastic fashions coming out of many or European vintage inspired/repro/pinup/rockabilly brands this year. I'm especially in love with the food themed offerings, but really, would go bananas (intentional choice of words :)) for any of these gorgeous offerings! How fantastic that you got to see them up close and personal and in the company of so many lovely fellow bloggers, very much including Carly/Cici. You ladies both look fabulous in your super pretty Voodoo Vixen frocks! 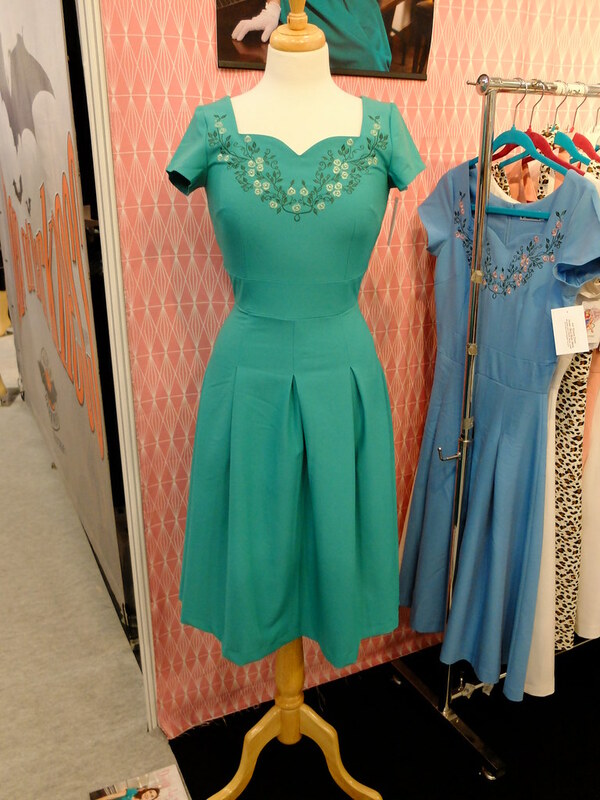 That Collectif dress is gorgeous!! I love it so much. You all look so fantastic! I love seeing all this different side for bloggers too. 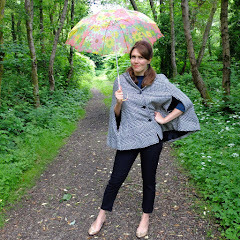 Thanks for stopping by and linking up at Whatcha Wearing Wednesday too! This sounds like such a great experience! You picked a gorgeous dress and I love your floral crown.